During his first season at the helm of the University of North Georgia men’s soccer program, Patrice Parris led the squad to an 8-10-1 record and a birth in the semifinals of the 2007 Peach Belt Conference tournament. In 2010, UNG recorded its best start in school history going 4-0-3 through the first seven games of the year. This year, Patrice plans to set the bar even higher. We connected with Patrice to learn more about his recruiting philosophy, style of play, and much more as he enters into his 11th season at the NCAA Division II program. 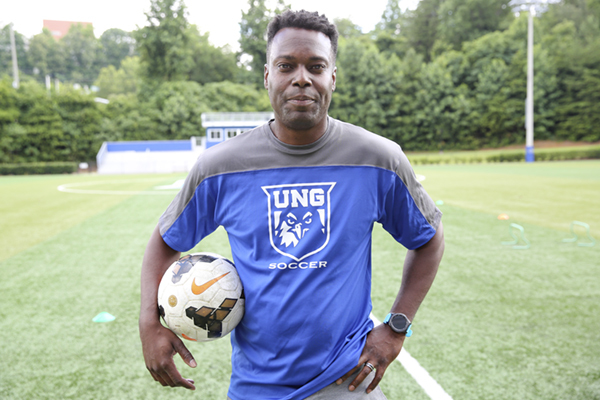 blacksoccercoaches.org: Why did you decide to become the head coach of the University of North Georgia 11 seasons ago? PP: The ability to be the head coach for our University of North Georgia allowed me the opportunity to grow our program as it made the transition from NAIA to the NCAA. The campus of UNG reminded me of growing up on different military bases as a “military brat.” We are located in the mountains of Dahlonega; it is a great location! Lastly, the University of North Georgia believed in me as a coach and as a person, working alongside great people and leaders with vision, makes my job much more comfortable. blacksoccercoaches.org: Recruiting season ended a couple of months ago, when you were in full mode looking for the next student-athlete to take your program to the next level, what were the qualities and characteristics that you were looking? PP: Without giving away too much information, we are always looking for players who have a high soccer intelligence and academic intelligence. We will always look for players who excel or have leadership qualities, players we can mold for our team to benefit in the long term and not short term. We are always looking to out recruit ourselves by increasing the competitive atmosphere within our program. blacksoccercoaches.org: How do you rank your priorities in relation to building your program? PP: There are no “off” days within our field. When one has the opportunity to grow a program, there are no off days. Your players will need your assistance at all times within their eligibility and afterward. blacksoccercoaches.org: What is your process for scouting when looking for the best players to suite your program? PP: Once again, without giving away too much information, one must be able to search everywhere and anywhere for the right player who will fit a program. Our resources have allowed us to find the right student-athletes which fit our team culture. Culture is everything, and if a particular player does not meet our particular climate, then we move on to identify those who do fit. blacksoccercoaches.org: How do you think your experiences as a player help you in the role as head coach? PP: My experience as a player allows me to connect with our student-athletes. Being able to relate with our players is essential to the growth of our program and our players. Our players understand that we as a staff have been through the process of playing within the NCAA and life after the NCAA. blacksoccercoaches.org: What are some things that you would like to see changed or improved by the athletic department to enhance your program? PP: The significant part about our program is that we can only go up. Our administration is aware that we are not where we need to be regarding our scholarships and our continued growth with facilities. This is a process and will take time to build. 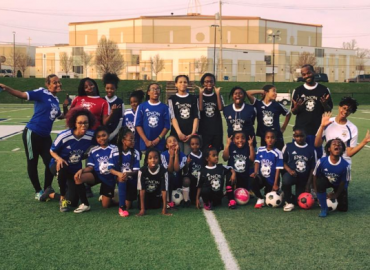 blacksoccercoaches.org: How would you describe your approach to building the program? PP: Accessing the positives of your university and the community, evaluate the operational budget, assess the opportunities to recruit locally, statewide, nationally, or internationally can be the foundation of how to grow a program. Scheduling will also be a factor when it comes to building a program, challenging your team when they are ready to be tested can set the standards of a program. Culture is essential, having the right type of culture will help develop the proper relationships within one’s program. 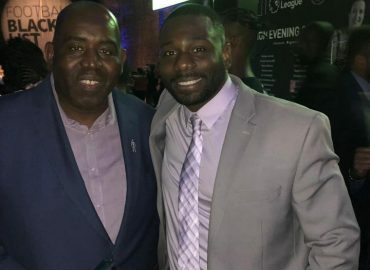 blacksoccercoaches.org: Where do you see the program at this stage and what are the next steps moving forward? PP: In my opinion, we are years away from 2007 when I first started. We have grown in so many areas: a new facility, the recruitment of student-athletes who are stellar on the field and in the classroom, the creation of new positions within our program and athletics, and the increase of our fan attendance. The positive growth within our program was never smooth, it is and will always be a process. The process just like many of my coaching peers is to have our style of play played at a high-level consistently against the great teams in our conference and region. 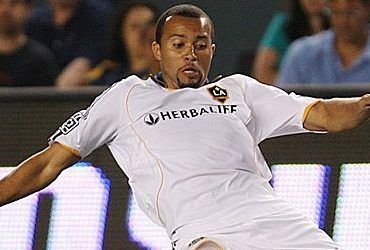 blacksoccercoaches.org: What are your ultimate goals for the program? PP: This may sound funny, but in 2007 with only seven players in the classroom, I told them that the long-term goal was a national title-they laughed! I told those players that I could not predict or give them a time frame, but that was the long-term goal. To reach this long-term goal, we would need those seven players to set short-term goals, goals which would allow them to believe in the process as they were the foundation. They were the group of players who would not play physically in winning a national title but would be an integral part of setting the standard of what was to be expected when playing for the University of North Georgia men’s soccer program. blacksoccercoaches.org: Do you want to establish a style of play? If so, how? Patrice and the University of North Georgia are scheduled to kick off their season on August 31st vs. Palm Beach Atlantic University. You can click here to follow UNG’s 2018 schedule.